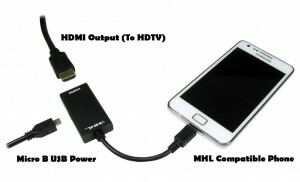 Currently there is a technology not widely known called MHL, which basically allows you to connect your smartphone with a high definition TV with HDMI support. Thus, we can see streaming videos, photos and games in the TV screen. 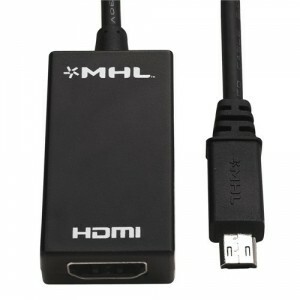 MHL stands for Mobile High -Definition Link, and it is a standard technology used to connect mobile devices with HDMI TVs, whatever the manufacturer of the smartphone and the television. It allows you to send large amounts of data using a few cables, making it possible to play streaming videos and music among other things. To connect our phone via MHL, we need to buy an adapter. These adapters have microUSB connection on one end and, on the other, an HDMI terminal, where we can connect the standard HDMI cable to our TV. You can purchase it for a price ranging between 5 and 20 € in any electronic gadgets store, such as Amazon. The MHL technology offers some additional advantages, including the possibility to charge our smartphone while connected to the TV, or the ability to control the phone through the TV remote control. Samsung has chosen a different approach than the other manufacturers and has opted for its own adapter, an 11-pin connector, different from the standard 5-pin adapters. However, this is the only difference, as the HDMI cable between the phone and the TV is the same and the television must be compatible also with HDMI. However, to know if our device has MHL technology available is not easy, because the adapter is connected to microUSB, and any Android has this type of connection. The safest and fastest way to check whether or not we have this technology is through the official website of MHL. You can find more information on the official MHL’s website.